That “highest and hardest glass ceiling” Hillary Clinton talked about shattering? As of Monday, there were five more big cracks. They surfaced after a weekend in which Sen. Elizabeth Warren (D-Mass.) formally announced her presidential campaign Saturday and Sen. Amy Klobuchar (D-Minn.) entered the race Sunday, joining Sen. Kirsten Gillibrand (D-N.Y.), Rep. Tulsi Gabbard (D-Hawaii) and Sen. Kamala Harris (D-Calif.). The roster of women officeholders vying for the Democratic nomination now numbers five — more than in any presidential primary election in history. It’s a groundbreaking moment, one that nearly all of the candidates paid homage to in their campaign launches. But it’s also a convergence of the political forces unleashed by the Trump era. The president’s style, rhetoric and policies have generated a backlash among women that has turned the traditional gender gap between the parties into a chasm, and that dynamic is already beginning to color every aspect of the upcoming presidential campaign — from the messaging to the kind of candidates Democrats are considering nominating to the very shape of the electorate on Election Day 2020. In Massachusetts this weekend, the optics of Warren’s announcement event at the Everett Mill, where a historic labor strike once led thousands of women to walk off their factory jobs, was designed in part to highlight the collective political power of women. The senator’s remarks alluded to the suffragette movement, as did Harris two weeks earlier in her Oakland rollout. Warren took it further in an Iowa stop on Sunday. Trump’s problem with female voters was laid bare in the 2016 election results. His caustic, often deeply personal attacks on high-profile women — including Clinton, the history-making Democratic nominee — fueled the largest gender gap in the history of exit polls. Trump lost women by 13 percentage points, 54 percent to 41 percent. One exit poll question, in particular, captured the distaste many voters had toward Trump’s demeanor toward women. When asked, “Does Donald Trump’s treatment of women bother you?” Seventy percent answered yes. There’s been little sign of improvement in his standing among women since then — and almost no concession to polling that recently revealed 56 percent of voters characterized Trump as “sexist,” compared with just 35 percent who disagreed with that characterization. At Warren’s launch events Saturday, it wasn’t difficult to find women in the crowd whose enmity toward Trump was close to the surface. That kind of deep hostility toward Trump, which translated into massive Women’s Marches beginning in the first month of the Trump presidency, served as the backdrop of a 2018 midterm elections that saw a surge in the number of women running for office — many of them citing Trump as a driving force behind their candidacies — and record-breaking numbers of women elected at every level, most of them Democratic. Rebecca McNichol, executive director of Emerge Pennsylvania, an organization that recruits and trains women to run for office, says the collection of Democratic women running for president reflects the ongoing dismantling of barriers and an emerging infrastructure that enables and supports women’s candidacies at all levels. In Pennsylvania, a state Trump carried in 2016, McNichol notes that women posted significant gains in the midterms — including the addition of four new women to the state congressional delegation. The question is whether that energy can be sustained through 2020, and harnessed against Trump. Also confronting the five women running for president is an unsettled debate about the role gender played in Clinton’s 2016 defeat. Clinton has frequently said she believes misogyny and sexism contributed to her loss. In a crowded field filled with well-funded and well-known candidates, there remains a good chance that none of the five women lawmakers running for president will emerge as the Democratic nominee in 2020. 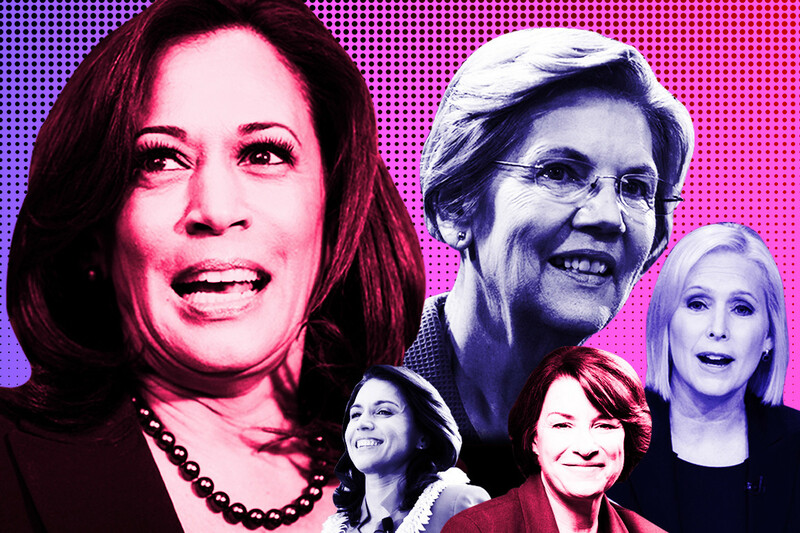 But whatever happens, many leading Democratic operatives believe there’s no turning back — with more women than ever in the candidate pipeline, presidential fields featuring numerous women candidates are going to be the rule, not the exception. Lake, the Democratic pollster, agreed that the impact of the 2020 field could be felt for decades.